WIU junior LEJA major Adam Fackler was awarded the ILGISA Student Award in Bloomington, IL by Nicole Gattuso, ILGISA president. MACOMB, IL -- Western Illinois University junior law enforcement and justice administration major Adam Fackler, of Lake Zurich, IL, was recently named the winner of the Illinois Geographic Information System Association's (ILGISA) Student Award. 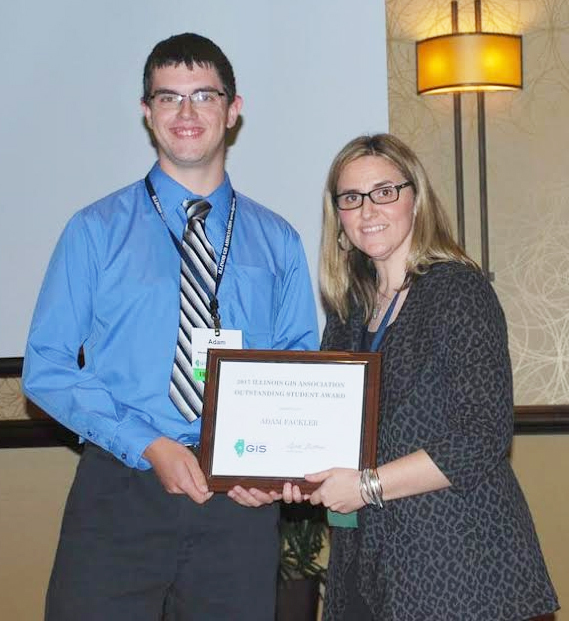 Fackler, a GIS and emergency management minor, received the award during the association's annual conference in Bloomington, IL, in September. The award is presented to an undergraduate student of any major who has included GIS in their course of study, demonstrated exemplary proficiency and understanding of GIS and made a potential contribution to the GIS community and to general success in school. "I am honored to have received the Outstanding Student Award and I want to thank (GIS Center Director) Chad Sperry and (GIS Specialist) Kei Nozaki, as well as my coworkers at the GIS Center, for teaching me so much about GIS and getting me to where I am today," said Fackler. "I've only been working in GIS for about 10-11 months and it still astounds me how much I learned and how I was chosen for this award out of all the other candidates in the state. I am excited to see what else I will learn during the rest of my time here at WIU and how I will apply that knowledge and skill after I graduate." Sperry said Fackler is an excellent student who plans a career in creating and maintaining digital maps for a state, county or municipal emergency dispatch center. He added that Fackler has worked at the WIU GIS Center since Fall 2016. "He is always thoroughly prepared, inquisitive, intelligent and eager to learn," said Sperry. "Adam has gained GIS experience while working on projects for Fulton, Greene and Calhoun counties in Illinois, this includes working with road ranges, gaining information from parcel data, editing structure address points and geocoding. The updated information significantly helps police and fire first responders in case of an emergency." Sperry said Fackler had a leadership role in gathering data for Macomb's Oakwood Cemetery to GPS point every tombstone, including images of the stone; and the name, birth and death dates; veteran status and search functions. "Adam has also become very knowledgeable about cutting edge technology, such as UAVs," said Sperry. "He is accurate, concise and reliable in his work and seeks to gain understanding to formulate reasoned conclusions." For more information about the award or the association, visit ilgisa.org/awards.html.